Shirts With Random Triangles: Mark Helfrich is an ex-Oregon head football coach. Oregon athletic director Ron Mullens made the announcement Tuesday night following a meeting with Helfrich. "We want to thank Mark for his eight years with the University of Oregon and appreciate his efforts on behalf of Oregon football," Mullens said in a statement released by the school. "We wish Mark and his family the best." The firing comes two seasons after Helfrich led Oregon to the 2014 College Football Playoff title game, losing to Ohio State. 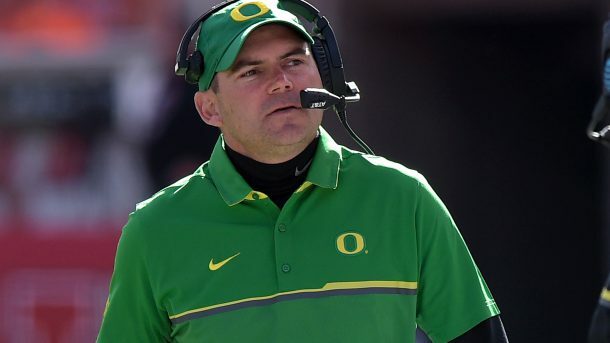 Helfrich was promoted to head coach of Oregon following the departure of Chad Kelly in 2013. He had a 37-16 record with Oregon.